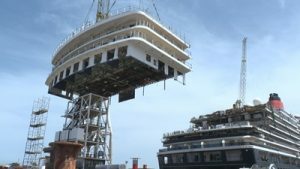 Following Cunard’s recent announcement of plans for a AU$59 million refurbishment of Queen Victoria, the luxury cruise line has revealed behind the scenes images and video of the stunning aft lido sun deck being lifted into place at the Fincantieri Shipyard in Palermo, Italy. The exquisite extended lounge space – only one of the many highlights amongst the new and refreshed onboard features – provides guests with additional deck space and unprecedented access to rays of light from sunrise to sunset. 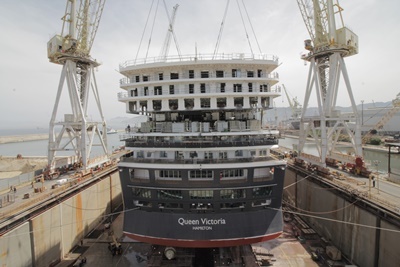 Queen Victoria was taken out of service on May 5 and is scheduled for completion on June 4, 2017. The newly refurbished ship will then return to Southampton before embarking on its maiden four night voyage, via Amsterdam and Bruges, before arriving back at Southampton.